My husband recently had a birthday. He wasn't happy about it. It was one of those with a zero attached and he was vacillating between checking out Ferrari dealerships and retirement communities. Although, to be honest, the draw of the retirement community was that no kids are allowed. Since we can't afford a Ferrari and we still have an 8 year old at home, we settled on cake. The tradition in our family is that the birthday boy or girl gets to pick their own cake and I make it for them. This year we had several contestants on So You Think You Can Be A Birthday Cake. When the elimination rounds were over, the final cake left standing was the Lemon Icebox Cake featured in the Fine Cooking that had just come in the mail. Lemon, creamy, and Rose Levy Berenbaum - what's not to love? Well, what's not to love is how long it takes. Not having thoroughly read the recipe, I plunged right in making the angel food cake. After that came out of the oven, it was too late to make the filling, so I left that for the next day. Which ended up being two days later. And then I realized that the filling was not a one-step deal. It was make a custard, make a meringue, fold the custard into the meringue, whip cream, and fold that into the lemon cream. So it was late at night that I was slicing and layering the cake (maybe that's why my layers were so uneven), and then the cake sat in the refrigerator another two days because we were sick and no one felt like eating it. When we finally got to the cake, I wasn't having warm fuzzy thoughts about it. More like, "eat the stupid cake and clear out the space in the refrigerator, already!" But that all evaporated with the first bite. Oh wow! Smooth, cool, luscious, tart and tangy, sweet, but not too sweet. My husband said it tasted like a lighter version of a lemon meringue pie. A crustless, melt-in-your-mouth version. Oh, hooray, my work was not in vain! My husband was happy, and that's what counts. That and staying out of Ferrari debtor's prison. 1- Make and cool the Angel Food Cake, following the directions below. 2- For the lemon filling, put the lemon zest in a 4-quart or larger bowl and set a medium-mesh sieve on top. In a heavy-duty 4-quart saucepan, whisk the egg yolks and sugar. Add the lemon juice, butter, and salt. Cook over medium-low heat, stirring constantly, until thickened enough to coat the back of a wooden spoon but still pourable, 4 to 5 minutes. (Don’t boil or it will curdle.) Pass the thickened curd through the sieve and mix in the zest. Cool, stirring occasionally, about 1 hour. 3- When the lemon curd is cool, beat the cream with an electric mixer on medium speed just until soft peaks form, about 2 minutes. With a large balloon whisk or silicone spatula, fold in the lemon curd. Cover the bowl tightly with plastic wrap and refrigerate. 4- In a small, microwaveable bowl, sprinkle the gelatin over 3 Tbs. water; let soften for at least 5 minutes. Microwave on high to melt the gelatin, 15 to 30 seconds. 5- In a heavy-duty nonstick 2-quart saucepan over medium-high heat, combine 1 cup of the sugar and 6 Tbs. water and stir constantly until the syrup is bubbling, 2 to 3 minutes. Remove the pan from the heat. 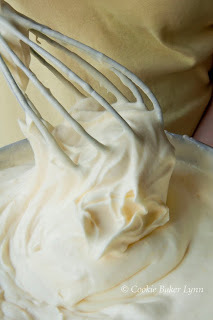 6- In a stand mixer fitted with the whisk attachment, beat the egg whites on medium-high speed until foamy, 45 seconds. Add the cream of tartar and beat until soft peaks form, 30 seconds. Gradually beat in the remaining 3 Tbs. sugar until stiff peaks form, 1 to 2 minutes. 7- Have ready a 2-cup or larger heatproof liquid measure. Return the pan of syrup to medium-high heat and boil until a candy thermometer registers 248°F (firm ball stage). Pour the syrup into the measure to stop the cooking and then immediately pour a small amount of syrup over the whites with the mixer off. Immediately beat at high speed for 5 seconds. Stop the mixer and add a larger amount of syrup. Beat at high speed for 5 seconds. Continue with the remaining syrup. Lower the speed to medium, add the gelatin mixture, and beat on medium speed for 2 minutes. Decrease the speed to low and continue beating until the bottom of the bowl is no longer warm to the touch, about 10 minutes. 8-Use a large balloon whisk or silicone spatula to fold one-third of the meringue into the lemon cream. Repeat twice more until all of the meringue is folded into the lemon cream. 9- Spread two 3-foot-long pieces of parchment or waxed paper on the counter. Position the cake so the top is facing up. Using a long serrated knife, remove and discard the brown top crust. Turn the cake bottom up and split it into 4 even layers. After cutting each layer, use two spatulas to lift a layer off the cake and put it on the parchment or waxed paper. Arrange the layers in the order you cut them so it’s easy to assemble the cake. 11- Spread one-quarter of the filling on the bottom of the pan. Place the smallest cake ring on top of the filling. Spread about one-third of the remaining lemon filling on top. Top with the next cake layer. Spread on half of the remaining filling. Repeat with the third cake layer and remaining filling. Top with the last cake layer and lightly press it down. Cover tightly with plastic wrap and refrigerate for at least 12 hours or overnight. 12- To unmold, wet a kitchen towel under very hot water and wring out the excess. Wipe the sides and bottom of the pan to help release the cake smoothly. 13- Set the pan on top of a canister that’s smaller than the pan’s removable bottom and higher than the pan’s sides, and gently press down on the sides of the pan. If it doesn’t slide down easily, apply more heat to the sides. 14-Run a long offset spatula between the bottom of the cake and the pan. Run a wire cake tester or wooden skewer around the inner tube. Invert the cake onto a serving plate and remove the tube portion of the pan. Slice and serve the cake. 1- Position a rack in the lower third of the oven and heat the oven to 350°F. Lightly oil the inside of a 10-inch (16- cup) 2-piece metal tube pan. 2- In a small bowl, whisk 3/4 cup of the sugar, the flour, and salt until evenly combined. Sift the remaining 3/4 cup sugar onto a piece of waxed paper. 3- In the bowl of a stand mixer fitted with the whisk attachment, beat the egg whites on medium-low speed until frothy, about 1 minute. Turn off the mixer and add the lemon juice and cream of tartar. Increase the speed to medium high and beat until soft peaks form, 2 to 3 minutes. Gradually beat in the sifted sugar and continue beating on medium-high speed until very stiff peaks form, 1 to 2 minutes. Beat in the vanilla. 4- One-quarter at a time, sift the flour mixture over the whites and, with a large balloon whisk, fold it in quickly but gently. It’s not necessary to incorporate every speck until the last addition of the flour. 5- Using an offset spatula, spread a thin layer of the cake batter onto the sides of the prepared pan to ensure smooth sides. Pour the remaining batter into the pan. Run a knife through the batter to eliminate air bubbles and smooth the surface. 6- Bake until golden-brown, a wire cake tester inserted in the center comes out clean, and the cake springs back when lightly pressed, 30 to 40 minutes. (A wooden skewer will still have a few moist crumbs clinging to it.) During baking, the center will rise about 2 inches above the pan but will sink to almost level with the pan when done. The surface will have deep cracks, like a soufflé. 7- Immediately invert the cake: If your pan has feet, simply invert it onto the feet. Otherwise, invert the pan onto a long-necked soda or wine bottle, or a large inverted metal funnel that fits into the tube opening to suspend it well above the counter (if using a soda or wine bottle, fill it with sugar, salt, or marbles to keep it from tipping). Cool the cake completely in the pan, about 1-1/2 hours. 8- Loosen the sides of the cake with a long metal spatula and remove the cake (still on the tube section) from the sides of the pan. Loosen the cake from the bottom and tube with the spatula or a thin, sharp knife. (A wire cake tester works well around the tube. To keep the sides attractive, press the spatula firmly against the sides of the pan, moving the spatula up and down as you go around.) Invert the cake onto a flat plate or work surface covered with plastic wrap. Happy belated birthday to your husband!! That cake looks amazing! Perfect for summer. Totally wow. tastes for lemon cake. It looks grand and I would love to have a slice of that cake action! Tell Bruce that the five-o will seem like nothing 6 years from now... from the voice of 'I wish I was five-o again' speaking! Ferrari's are over-rated. A roof over your head and a beautiful wife is much nicer! I love lemon cakes but this one seems like a lot of work, so good for you in doing such a great job! It looks and sounds like it was delicious, I'd just like someone to make me one. 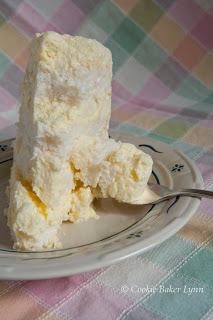 Thank you for this method of Italian meringue (or is this one Swiss? Or French? Never know which is which). Always had a 50/50 chance of a bowl of spun sugar. A lemon meringue pie style cake!? Sounds amazing and looks so nice and fluffy delicious. Sounds like it has the most complicated filling ever though! But I'm happy to hear it was all worth it. Happy belated birthday to your husband! Oh my this looks amazing. I can almost taste it just looking at the pictures. Happy Belated BD to your husband. This cake is quite special. I feel the softness and moisture of it. Lemon is my chocolate so I would be very happy to have this cake any day Lynn. ah, leave it to a man to pick a labor-intensive cake like this one. :) it looks downright delightful. Lucky hubby! Happy Birthday to him!! This cake looks awesome, especially if you love lemon like I do. SO pretty, too. One can tell just by looking at it that a lot of love (time) went into this cake. Still, if you keep this up, you're going to have to change the name of this blog to Cake Baker Lynn--you have be turning out the masterpieces this year! What a gorgeous cake, Lynn. You did a great job and I'm glad everybody liked the way it tastes, especially after that much work. I giggled when I read your comment about "eating the cake already", ha ha. Happy belated bday to your husband! Belated Happy Birthday to him. Cake looks so good. A nice change from the usual rich fare! Yeah, those 0 birthdays are tough. And wow on this cake! It's got all the stuff I love in it...how can you go wrong? Angel food cake, lemon curd, meringue and whipped cream. Because of the time involved, this is definitely a cake to make for a special event. Looks like it serves a lot of people too. Wow!! I'm so not a fan of labour intensive cakes. But this one definitely sounds like it's worth the effort! I can almost taste this cake. Being the baker in our home, no one ever bakes me a cake for my birthday... This looks just lovely although it sounds like a lot of work! Love the post - eat the cake and clear space in the fridge!!! After some setbacks I changed course mid-recipe and threw the curd and the meringue in a graham cracker crust and baked for 10-15 minutes at 325. Best Lemon Meringue Pie I have ever had. Thanks for the accidental inspiration. Like you, I'm not much for multi-step cakes and this one has several. But you made it sound so good I had to Pin it so I could come back to it later in the summer. Thank you for sharing your step by step. Can't wait to try it. I saw the photo of your cake on Pinterest & knew I had to try it. I opted for a mix cake, but I followed every step for the filling, and it is DELICIOUS! I posted a photo of mine on my blog- OhLeona.org. Thank you! This sounds absolutely divine! I may make it for my own birthday. An easy fast fix. Store bought angel food cake. Blend a lemon pie filling with a container of Cool Whip. Frost, Chill and serve. Voila! The quick and easy knock off when time is an issue. For the Angel Food Cake, why did you sift the remaining suger onto wax paper, why didn't you just sift it into a bowl? For the cake, why did you sift the sugar on wax paper instead of in a bowl and then pour it into the mixture? Found this recipe on pinterest and it really does look like heaven! While the amount of work does seem a bit intimidating, the number of eggs is shocking. I'm having a hard time wrapping my head around the suggestion of 11-12 large eggs to make 3/4 cup of yolk. Could you reassure me that this accurate? Made this yesterday. It took all day but it is worth every minute. Beautiful and delicious. Anonymous - Yes, it really is that many eggs. And it's totally worth it. Who is Pin Dot? - I'm so sorry it fell out! How frustrating! Since I'm not there, I can only agree that it was either slightly undercooked or the pan's fault. I hope, if you gave it another try, it turned out better! DON'T GREASE THE PAN! !I have to start over now....my cake is 3 inches tall and fell right out of the nice greased pan. Please note that Fine Cooking (and therefore your published adaptation) needs to correct the reference regarding the Angel Food cake itself-- do not oil the cake pan before putting the batter in the pan for baking. Rose Levy Berenbaum made this comment on her own blog when the recipe was first published. You oil the pan when using it to mold the components--not for baking the cake. I never noticed when you add the unflavored gelatin mixture to the egg white frosting.. read it twice.. maybe I missed it. Also... I only used 5 egg yolks and my lemon turd came out great. Not going to have all that extra cholesterol in my cake if not necessary:) Cake photo looks great otherwise... very summery looking dessert. 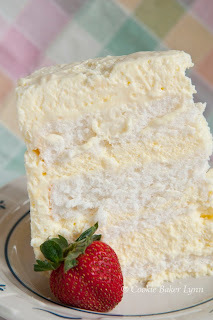 Will make it with store bought curd, store bought or box angel food cake, cook whip and boxed fully white frosting.. (7 minute type)... and save a lot of time... homemade angel good cakes taste too "eggy" for me... but to each his own. Great combo of fluff and lemon and cake! My husband has a birthday coming up soon. Won't be a "0" added birthday for at least 2 more years, but plan on making the cake anyway for his birthday. For all you ladies out there he prefers pie for his birthday not cake! 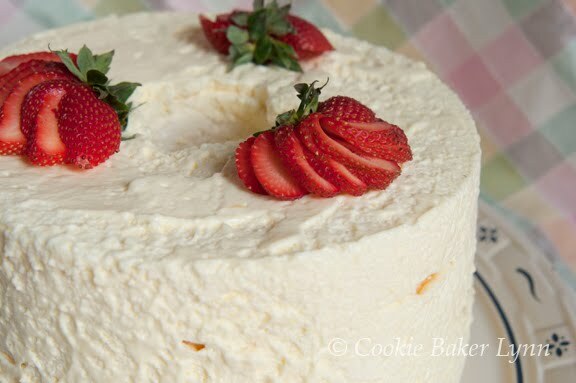 I plan to make the cake anyway and more than likely will use boxed Angel cake. The amount of eggs is scary, but so is a pound of butter to make a Coconut Frosting using a French Butter Cream recipe I recently obtained. Good luck to all who make this cake!!! So nice that you credit the baker and author of the recipe. Even nicer if you spell her name correctly. There's an easier way and it is one of the BEST cakes you will ever eat! Use a French vanilla cake mix, a box of lemon pudding, and a buttercream or cream cheese frosting with a little lemon juice and lemon zest in it. Bake the cake and cut round layers in half. Spread a little pudding in between the layers. Frost the cake. You're basically building a doberge' sorta :) Enjoy! I just made this for the second time.....thank you for this fabulous recipe!